October saw the use of BlackBerry OS 7 increase to 26.5% of users. This was the largest single month gain in the past year, but follows two months of very little change. The increase came mostly at the expense of OS 5.0 users, as the other OS versions remained mostly steady. The majority of remaining OS 4.x devices are Curve 8520 devices running OS 4.6.1 in the UK. In fact, an astounding 58.1% of all OS 4.x devices are in the United Kingdom. This data was taken from downloads of the free BlackBerry strategy game Pixelated. 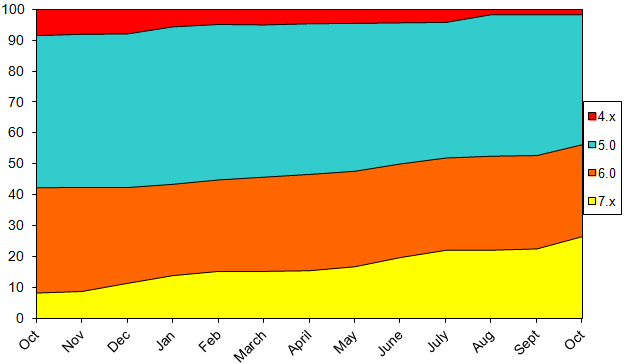 Data shown on the chart is from the beginning of October 2011 through the end of October 2012.